Easter is just around the corner and what better way to celebrate than with a little festive baking! 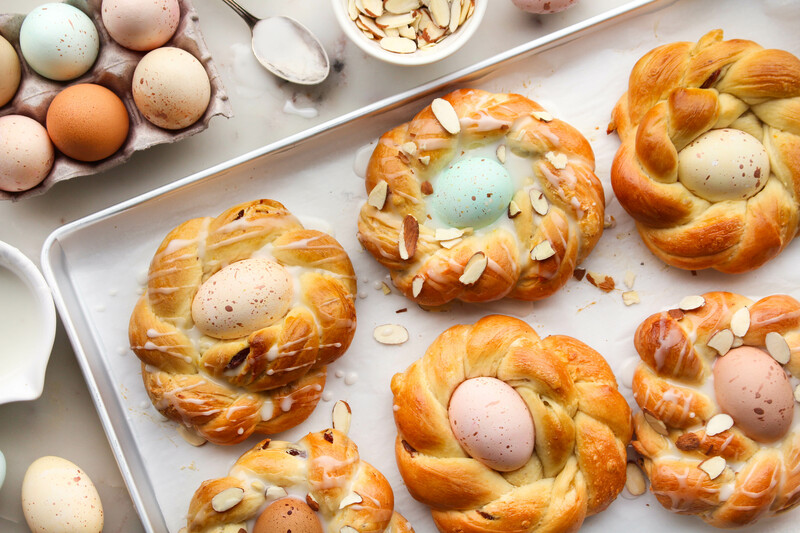 We are excited to partner with Red Star Yeast this year to share a fun bread recipe, that would make the perfect festive addition to your Easter brunch spread. 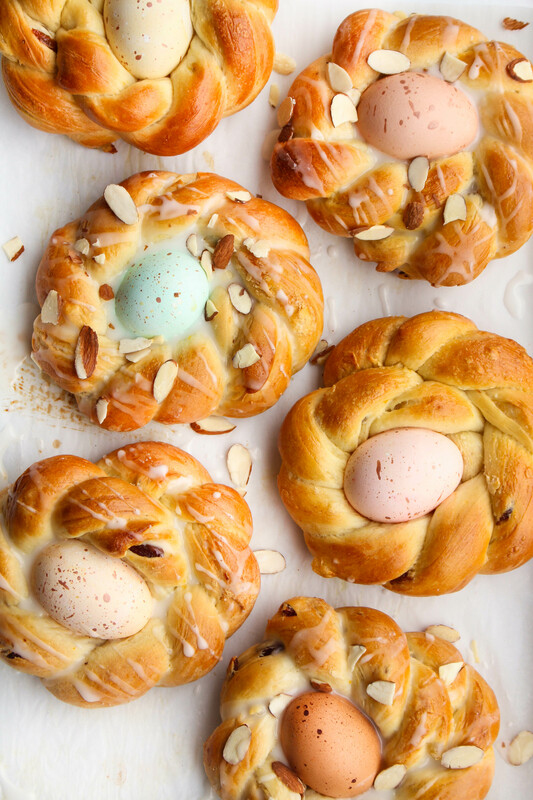 These fluffy, yeast breads are scented with fresh orange zest, studded with plump raisins, drizzled with a sweet almond almond glaze, finished with a sprinkle of toasted almonds and a few festively dyed Easter eggs. So not only are they delicious; they also make for a fun Easter DIY project. For our Easter egg breads, we had some fun playing around with pastel colors and speckles to achieve a natural look. We used this article a reference when dying our Easter eggs to make use of some pantry and fridge staples to naturally dye our Easter eggs. Follow the directions below to achieve similar colors to the ones we have in the photos. Prepare 2 cups Strongly brewed black coffee & stir in 2 tbsp vinegar. In a large pot; bring 4 cups of water, 2 tbsp vinegar and 4 cups of shredded beets to a boil. Reduce heat & simmer for 30 minutes. Strain dye into bowls and allow to cool to room temperature. In a large pot; bring 4 cups of water, 2 tbsp vinegar and 4 cups of chopped purple cabbage to a boil. Reduce heat & simmer for 30 minutes. Strain dye into bowls and allow to cool to room temperature. In a large pot; bring 2 cups of water, 2 tbsp vinegar and 4 tbsp ground turmeric to a boil. Reduce heat & simmer for 20 minutes. Pour dye into jars and allow to cool to room temperature. Prepare red cabbage and beet dye solutions as directed above & soak eggs first in the beet dye and then the red cabbage dye for equal amounts of time to achieve a lavender color. Prepare red cabbage and turmeric dye solutions as directed above & soak eggs first in the turmeric dye for 15-30 minutes and then the red cabbage dye for 5-10 seconds to achieve a pastel green color. ** Note: You can also use brown eggs but the color results will be a little bit different than those pictured. Fully submerge your uncooked eggs in the coffee (2-3 at a time depending on the size of your jar). Allow eggs to soak in the color 10-30 minutes, depending on the color instensity you desire. I recommend checking on them every few minutes. Remove eggs with the tongs and pat dry with a paper towel. Set on a wire rack to dry completely before proceeding with gold speckles. For the gold speckles; use an edible gold liquid or powder such as this one. Mix it with a bit of water to form a thick liquid gold. Take a loose paint brush and dip into the gold liquid. Use your finger to flick the gold onto the eggs randomly. Allow eggs to dry completely and repeat process on the other side of the eggs. Allow them to dry before proceeding to bake with them. 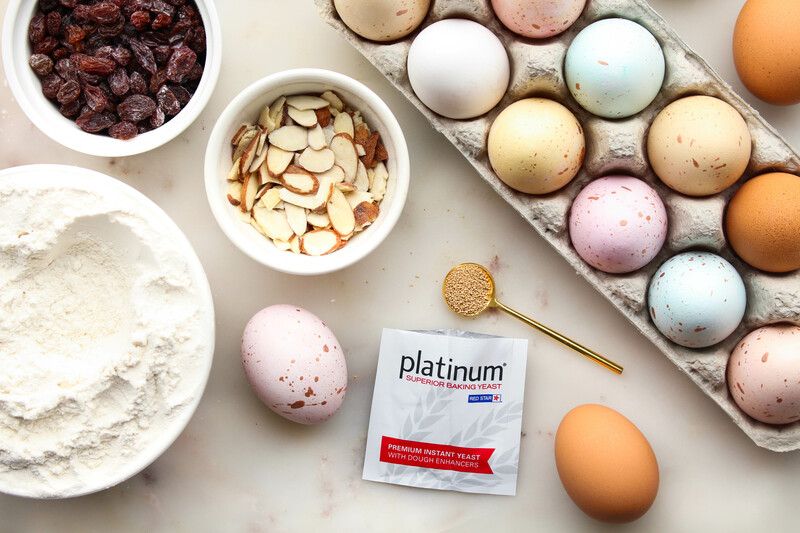 Plan on a fun Easter baking project this weekend by following the Red Star Yeast Original Recipe here . 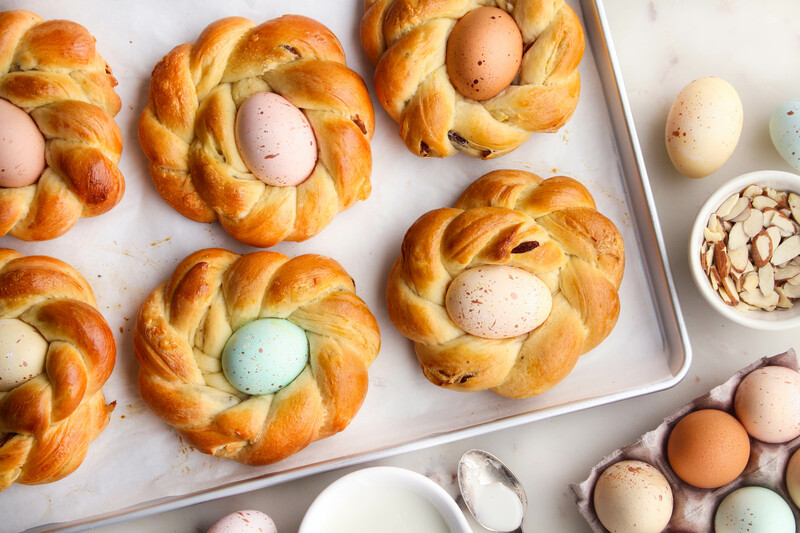 You have the option to either create one large Easter egg bread ring or if you would like to make mini bread nests like these; follow the shaping instructions below. Preheat your oven to 375 degrees & line two baking sheets with parchment paper. Once you have prepared your dough and given it time to rise, continue with shaping. Punch down your dough & turn it out onto a clean dry surface. Divide your dough into 12 equal pieces. Use your hands to gently roll & stretch each piece into about a 12 inch long rope. Take two pieces and pinch two of the ends together. Then twist the dough ropes together to form a braid, pinching the other two ends together once you get to the end. Now loop the braid around in a circle to form a nest, ensuring that you leave a bit of a hole in the middle about the size of an egg. Repeat this process with the remaining strips, so that you end up with 6 nests. Place your nests onto prepared baking sheets (3 per sheet) Cover with plastic wrap and allow to rise in a warm place for another 45 minutes. Once your nests are done rising, use a pastry brush to gently brush them with egg wash (beat one egg, 1 tsp milk and 1 tsp sugar together). Finally gently press 1 whole uncooked dyed egg in the center of each nest; gently press down into the center of the nest. Bake for 15-20 minutes or until golden brown. Remove from oven and place on a cooling rack to cool. Once cooled, mix together your almond glaze (referenced in recipe here) and drizzle over the nests. Sprinkle with toasted slivered almonds.